I got my copy of The Lights In The Tunnel for free, and now you can too. Martin Ford’s recent book discusses the growing capability of artificial intelligence and robotics to replace workers at all salary levels and what a sharp rise in automation may mean for the global economy. Ford believes that without drastic adjustments to the way the market is structured, automation could bring the whole system crumbling down. 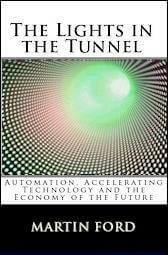 In the interest of boosting sales and spreading the message, The Lights In The Tunnel is now being offered free for download as a PDF via its website. As I mentioned upon reviewing the book this past winter, I don’t agree with Ford’s conclusions, but I do think he is one of the few authors spending time exploring the long term and potentially extreme consequences of what automation could mean. That’s important. Practically every day at Singularity Hub we show you some new amazing feat of automation. Everything from scientists to shish-kabobs is getting a computer or robotic make-over. Yet the global economy still relies mostly upon human labor. What happens when automated systems make up 10%, 25%, 75% of the effective workforce? Some may point to the rise in structural unemployment as a consequence of advances in technology already present today. The Light In the Tunnel proposes that nearer to full-automation, a lack in consumer purchasing power will effectively slow then shut down the global economy. Personally I believe that automated systems will enable an explosive growth in cheap and effective technologies that lead to more workers pursuing creative and cooperative endeavors. Clearly there is room for people with differing opinions here on the Hub. If you’ve been considering these possibilities (and if you haven’t, you should) The Lights In The Tunnel is a good launching point for the discussion. Give it a read, even if it’s only to know why you disagree. …oh, and if you do like it, help Ford out. Buy the paperback (~$13), or the Kindle version (~$7) to show your support. We need more authors willing to bring critical thinking to discussions about the future.